Pot fillers make it easier to make your next batch of soup, so here are some benefits of adding them to your kitchen. Now that fall is here it’s officially soup season! Although there are plenty of soups and stews you can enjoy during the spring and summer, nothing is better on a cold autumn day than a steaming bowl of soup, some bread, and some butter. Pot fillers make it easier to make your next batch of soup, so here are some benefits of adding them to your kitchen. Depending on how your kitchen is arranged, your sink might not be within easy reach of the stovetop. This setup can make cooking more challenging than it needs to be, especially if you’re not able to hold heavy items for too long. Prevent any injuries to your hands, wrists, and back by using pot fillers instead. 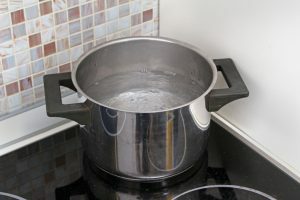 Plus, when you need to fill up or clean a large pot that won’t fit in your regular sink, a pot filler can dispense the water you need for it. Pot filler faucets allow you to do more in the kitchen. Once you have a pot filler installed above your stove, you can use it to fill up the pots that you need to use. This means that the other sinks in your kitchen are now available for other tasks – whether you need to rinse fruits and vegetables in your prep sink or rinse some dishes in the main kitchen sink before putting them in the dishwasher. Doing all of this will help save time when you’re trying to prepare a complicated meal for the first time, and you can manage everything without needing to ask someone for some help. One of the most aggravating parts of being in your kitchen is keeping it clean. However, a clean and tidy kitchen is more enjoyable to spend time in. Pot fillers help you keep your kitchen clean. This means that your sink won’t always be full of clutter – pots and pans take up valuable sink space, especially if they’re used and never cleaned after they’ve been used. Whenever this happens, it means that they are left on the stovetop. Spills and stains are other kitchen nightmares that you can prevent with pot fillers; at the very least, they won’t happen as often. Get more out of your kitchen, and install some pot fillers today! This entry was posted on Tuesday, September 25th, 2018 at 1:57 pm. Both comments and pings are currently closed.